Alphabets and numbers are the first things that small children learn when they go to the nursery or kindergarten. To make learning fun and interesting to these little young ones, teachers often connect studies with stories, toys and animals. This makes learning easier for them but they can remember these things well. Counting and numbering can be difficult to start with. 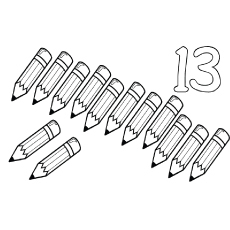 But when different ways of teaching are adapted such as coloring pages of numbers 1-10 to teach the children, then, the children will understand and remember it better. Moreover, children love to color and use colors freely according to their imagination. So when studies and coloring are done together the result is bound to be fantastic. 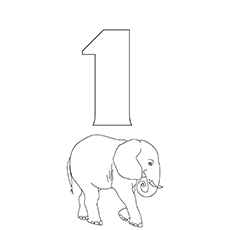 This coloring sheet has one elephant and number one written at the top. The elephant is of medium size and is an easy animal for coloring as there are not many specifications. Moreover the children love animals such as elephants and will be inspired to start coloring. 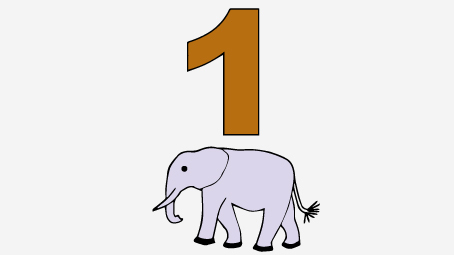 This way they will get introduced to the number 1 and also to elephant. 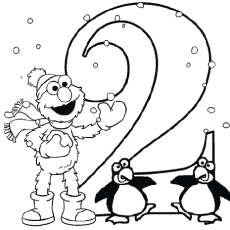 The number two in this coloring sheet has been embedded in the cartoon. It is an expressive cartoon character. Children will not only love to color but also draw this number 2 cartoon again and again as it is easier and attractive. Along with the number two cartoon, the number has also been written in words to make it easier for the kids to remember. The number box below the sheet indicating two rounds in the first two squares also are given to make things much easier. 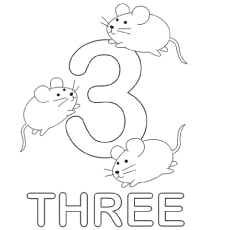 Again, a very interesting coloring sheet that shows three mice placed at three ends (top, middle and end) of the number three drawing.The cute drawings of the mice look like cartoon characters and are sure to interest the young children. This whole coloring sheet is a good way to introduce your child to animal drawing as well as getting acquainted with the number three. It is important that the child loves what he is doing to keep his interest intact. 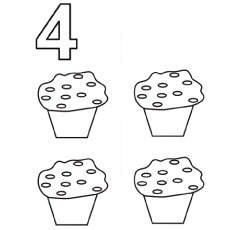 This coloring sheet with the number four has four lovely cup cakes that are sure to tempt young children. From young to old, everyone loves cakes and when it is time to color them, children will enjoy using their favorite colors and toppings to complete the picture. This picture showing the number five has five cute little teddies arranged in a row. Teddies are the favorite soft toys of young children . When they get to color a sheet having five such cute teddies they are inspired to use their creative imagination. They also learn to count five and identify the number as well. Butterflies are lovely and colorful and the children always aspire to color them, touch them as they are attracted to this light multi-hued flyer. 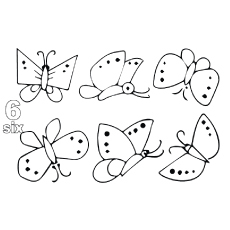 This coloring sheet has six such small butterflies to indicate the number six. So, the children have to color all the six butterflies using their imagination and then count them. This way it will be easier for t hem to learn counting six objects. This coloring sheet has seven small fish that are coming down and look as if they are going to hit back the water. 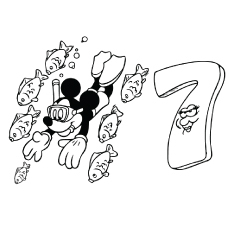 The number seven is written clearly on one side of the sheet so the children will have to color all the seven fish and color the number seven. So, they are sure to grasp this number after so much repetition. Who does not love ice creams? And when the children are made to count ice-creams and color them they are bound to remember the number all the more clearly. You should encourage your children to color all the ice cream cones in different flavors . The use of various colors will help them get acquainted with multiple colors . They will also learn how to count eight and identify it. Lovely, red strawberries look quite tempting and children love the flavor in ice creams, milkshakes, drinks and chocolates. A coloring sheet like this will tempt them to try out their hand at coloring . Make sure that they learn the art of coloring the smaller strawberries in red or pink without letting the color go out of the line. Coloring nine strawberries at one time will help your child to learn how to color a small fruit. This will also teach them to count number nine and identify it. Beautiful and small flowers attract the attention of young and old alike. This coloring sheet has ten small flowers with two leaves. 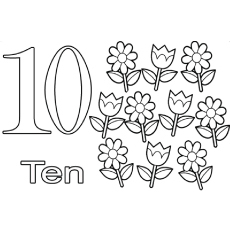 Two different varieties of flowers are included in this count of ten and the number ten is written as well. The children are expected to color the flowers, their leaves, stem and the number ten. This is very stimulating for the small kids who will be completely engaged in creating their kind of garden. While coloring the number ten they will learn how to draw ten, and will be able to identify it easily. See the cute Muppet standing between the two number ones that make eleven. She is wearing bows on her hair; we also see her wearing beaded necklace and bracelet with a star. 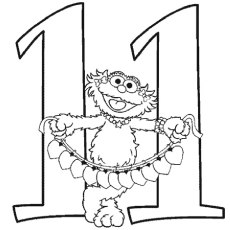 Your child will enjoy the cute Muppet and the number eleven. If you have a little daughter she will take special care in coloring the Muppet and her accessories. Her imagination will soar high as she makes this page look superb by using all the colors from her pencil box. Children love playing with balloons. Many a times, you must have heard them requesting you over and over again for balloons. Children gather around balloon vendors and ask them to give the brightest colored balloon. The funny Muppet character from Sesame Street holds on to the 12 balloons and just see how excited she looks. 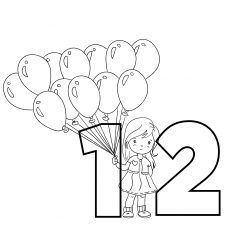 Your child will instantly connect with the picture and will thoroughly enjoy coloring the balloons with his favorite colors. Your child must be using coloring pencils, pastel crayons, felt pens or water color to make these coloring pages look bright. He will be excited to color these pencils and notice what shade he adds to the pencil leads or nibs. This is his chance to experiment with different shades tomake the color pencils to look even brighter. Don’t be surprised if the coloring pencils resemble the one he already has. This coloring sheet will not only help him to learn the numbers but also the names of different colors. As a parent you will be able to understand whether your child remembers the name of colors you taught him earlier. Do bears and ladybirds make great friends? At least, they do in this picture! Ladybirds have red wings with black polka dots on them. They are fourteen ladybirds, including the one baby bear is holding in his hand. 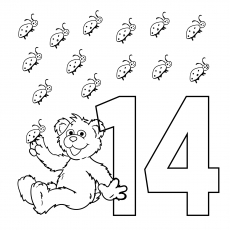 Your child will have great fun coloring the baby bear and the lady birds and also the number 14. This is perhaps the best time to teach your child several languages other than his mother tongue. 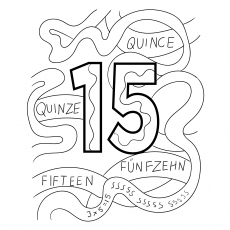 Here are number 15 in different languages. There is a good scope of coloring all the minute details in the picture and make it look all the more appealing. Don’t forget to pin it up in his room or you can also maintain separate file for number coloring pages and use it as a study material. Penguins are wingless birds that stay in Arctic and Antarctic regions. They swim in ice cold water and waddle around in the icy cliffs. These cute looking birds are black in color and their underbelly is white with a shade of yellow. There are many animated films on Penguins that your child must have watched so this number page is very suitable for him. 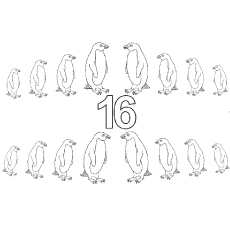 Guide him so that he colors all the sixteen penguins correctly. Does your child loves singing ‘twinkle twinkle little star’! You must have seen have seen your little one staring curiously at the night sky looking for stars. 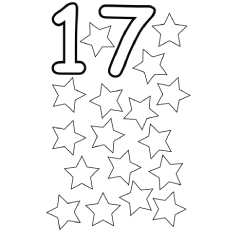 Here is an opportunity for him to count the stars, give him this coloring page and ask him to count the stars loudly. Don’t stop him if he chooses to color the stars in different shades instead of coloring it golden. You can also ask your child to add some glitter to create some star dust. This will make the number page look magical! 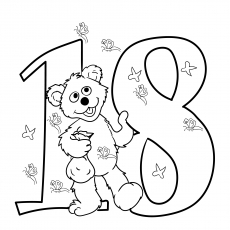 This is a very cute number page your child will simply love coloring. Children have an affinity towards teddy bears and he must be decorating his room with teddy bears. This picture shows a baby bear holding on to number 18 and is surrounded by delicate butterflies. Your child will use his creativity to color the picture with different shades and make it look bright. Did you know the maple leaf is a national symbol of Canada? It was adopted a national symbol in 1868. The leaves of the maple tree have a unique shape. Maple trees are found in U.S. city of Carthage and Italian city of Campobasso. Many countries and organizations use the stylized maple leaf as a logo. 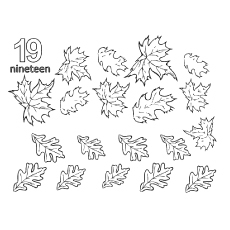 Here are 19 maple leaves for your child to color. If he is not aware how a real maple leaf looks like you can always show him some pictures on the internet. There are 20 cute smiling apples in this picture. There is also a list of numbers from one to twenty and the number twenty is circles for easy recognition. 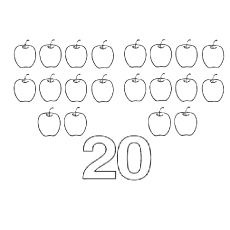 Ask your child the count the apples loudly as he colors them, this will help him to remember the order of numbers. This is a real test for your little one. Ask him to write down the numbers and check if he does it correctly. This number game will teach your child which number comes after what. Ask him to fill the missing numbers on the rain drops. 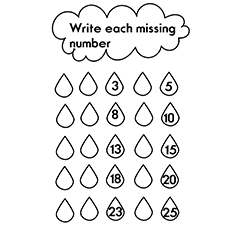 Guide him to use a light blue pastel crayon to color the raindrop, color in such a way that the numbers are visible. You can use silver grey for your cloud and use some silver sparkles to make the page look bright. Learning and coloring was never so much fun isn’t it? Make sure your child writes his name and date on the coloring page. You can also use these coloring pages as a future study material. 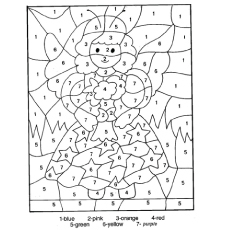 These number coloring pages can be given one at a time to the children. Giving them one or two everyday will ensure that they have grasped the first few numbers well and then can now understand and grasp the other numbers. These pages will make your child thoroughly acquainted with the number system. Your kids will surely have a fun time doing these free printable number coloring pages. They will also learn to use colors in a fun way. Do share your views with us on the experience of your child while coloring these pages.